I’d like to consider myself lucky for being invited to attend the Centennial Gala Night of Nestle Philippines held at their main office in Rockwell last June 8, 2011. It was such a rainy evening and I had to brave the hellish traffic along EDSA just to make it to the said event, but I’d have to say it was all worth it. Nestle products have played a major part in the lives of every Filipinos over the years. Nestle Philippines had reached a remarkable milestone in its enduring mission of providing generations of families with quality food and beverage products that promote nutrition, health and wellness. In celebration of its 100th year, the Nestle project SINE Kasambuhay was born. The vision was about exploring the multitude of stories of how Nestle has been a Kasambuhay (Companion) to close to 100 million Filipinos for 100 years to be told in different stories in 100 minutes. For the said project to be possible, Nestle partnered with advertising directors such as the likes of Chris Martinez, Sid Maderazo, Jun Reyes, Stephen Ngo, Carlo Directo, among others. Nestle gave them the opportunity to tell their very own Kasambuhay narratives through 10 short films later compiled in a 100-minute film. I had been privileged to watch the 10 short films with different genres. The collection has drama, romantic-comedy, musical, fantasy, satire, family comedy, suspense thriller, adventure, mock-umentary and even Shakespearean parody. Stories of tenderness amidst grit, friendship amidst trials, even poetry in a food fight. Stories of nourishing imagination, of finding miracles and tenderness where one least expects it, plus stories of love and the many ways it moves us. Actors Eddie Garcia and Marvin Agustin leads the film Unplugged, an adventure of discovery. Ms. Gloria Romero and Sid Lucero in the gritty urban drama film, Silup. The Kasambuhay, Habambuhay (Companion in Life, for Life) Short Film Anthology is made up of varied short stories that are really heart-warming and makes one feel good. At some point, I couldn’t stop laughing while watching the film. But there were also times when I would be teary-eyed because I was touched by a certain scene in the film. The films even had great cinematography and music. Not to mention, the popular actors and actresses that were part of the said project like Eddie Garcia, Ms. Gloria Romero, John Lloyd Cruz, Sid Lucero, Marvin Agustin, Eugene Domingo, stage actors Bodjie Pascua, Isay Alvarez, Robert Sena, Ramon Bautista, Emil Buencamino, child actress Jillian Ward, and newcomers Solenn Heusaff, Dominic Rocco and Neil Coleta. They all played very important roles in those 10 short films with different genres. I went home that rainy night all wet and drenched from the heavy rainfall, but my heart was filled with emotions and I truly had a lot of fun watching the Kasambuhay, Habambuhay Short Film Anthology by Nestle. Veteran stage actor/master storyteller Kuya Bodjie is in Sali Salita (Word Play), a family fantasy drama. Upcoming actor/commercial model Neil Coleta leads the musical comedy Oh! Pa Ra Sa Ta U Wa Yeah! Child actress Jillian Ward supports neophyte Neil Coleta in the musical comedy film. I totally fell in love with each movie but my favorite was Tingala sa Baba (Look Up Below), a coming of-age-satire film. The story was so simple, yet the irony in the said film played a big part in the end where one realizes that friendship is more valuable than money. The Kasambuhay, Habambuhay Short Film Anthology is, by far, the most varied, most freehanded and ultimately most surprising collection of Nestle stories. The good news is, the film will be shown for FREE in selected cinemas nationwide and will also be telecast as a special anthology on TV. Yes, you’re reading it right. 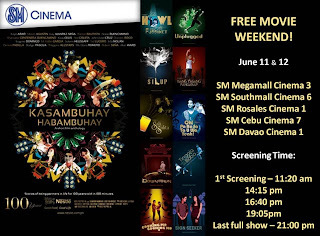 The said short film anthology will have special screenings at selected SM cinemas on June 11, 2011 and June 12,2011. Admission is FREE and it is OPEN to the PUBLIC. All you need to do is to show up at these selected SM cinemas on the day of the special screening. A scene from the coming-of-age-satire Tingala Sa Ibaba. Actor John Lloyd Cruz is the lead in the romantic comedy Sign Seeker. Commercial model turned celebrity and current "It" girl Solenn Heusaff plays a role in Sign Seeker opposite John Lloyd Cruz. I’m actually thinking if I could join my family this Saturday as they are planning to go and the watch the Nestle Short Film Anthology at SM Megamall. I’d love to see those films again. I think I’d never get tired of seeing them. So if you’re jonesing for a feel-good movie, then Nestle’s Kasambuhay, Habambuhay Short Film Anthology is for you. Nestle even gave bloggers and invited guests a limited-edition cook book. I’d strongly suggest you bring your entire family and invite those you know to come and catch these films at the special screening dates. This is a once-in-a-lifetime project from Nestle Philippines that you can’t afford to miss. Enjoy it now or wait for another 100 years. 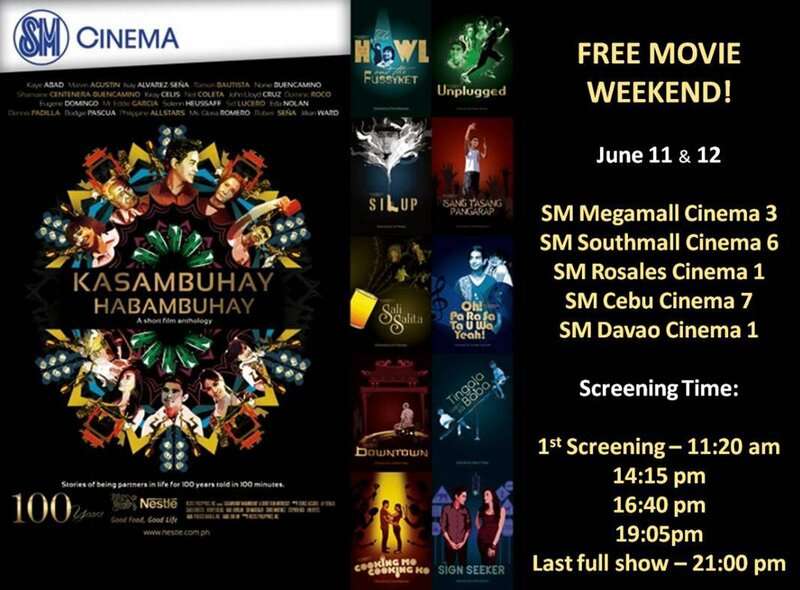 Screening Schedule are as follows at selected SM Cinemas nationwide. Congratulations and more power to Nestle Philippines! May they continue their commitment to help nurture generations of Filipino families in the next 100 years. Purple Plum Fairy thanks Nestle and Mr. Carlo Ople for the invites. :( huhuhu ... i so wanted to go to this event. As for Kuya Rain, don't be sad, you can still catch it at selected SM Cinemas like SM Megamall. I have the screening time posted on my blog post so be sure to bring your family when you see it. It's really good. Purple Plum Fairy thanks the two of you for visiting my blog site. See yah around! Thank you for choosing Tingala sa Baba as your Favorite, it's my favorite too. Hi, Eubert! Thank you for visiting my blog and for taking time out to post a comment as well. I really appreciate it. hello, saang sm po my free movie of nestle anong branch po specifically, pls help, thanks! Hi, Anonymous! Thanks for visiting my site. Sorry I don't know the title of the song being played at Sign Seeker. But it's a song by Loudbox, as stated in the programme given to us during the screenings. You can check out Publicis Manila or Nestle office for further details. I'm sure they know a thing or two about your inquiry. Hope that helps. thanks for visiting my site Andy. I'm glad someone posted that song on my blog as well. I have been receiving quite a few questions about that theme song from Sign Seeker as well. Loudbox is an audio production house in the Philippines. I thnk they are not the artist of the song but the one who produced it. Hi, Anonymous..."Waiting for a Sign" is the title of the song you've been asking about. I am sorry for I thought you've seen it on this thread so there's no need for me to comment here. But it seems to me, you've somehow overlooked, so here I am.